This research project evaluates the political feasibility of expanding the utilization of the Gulf Cooperation Council (GCC) grid. It analyzes the domestic political will, and internal dynamics, for five of the six GCC member countries: Saudi Arabia, the United Arab Emirates, Kuwait, Oman and Bahrain. The project applies the KAPSARC Toolkit for Behavioral Analysis to assess the potential for areas of agreement among policymakers and their domestic constituents. 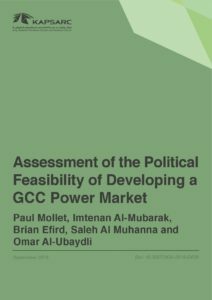 It examines the domestic political feasibility in the five countries for a regional electricity market in the GCC.